Yesterday we created a follow along link highlighter. You can keep track of all the projects we're building here. Today we're exploring speech synthesis. The speech synthesis API is available in most modern browsers. This allows us to create some pretty nifty text to voice functionality. A select component that allows us to select the voice we want. 2 Sliders to control the rate and pitch of the voice. 2 buttons to start and stop the speech synthesis. Like most of our projects in this course Wes has already provided the basic HTML and CSS we're just going to be inserting the JS. Quick note: Our rate, pitch and text must be named these exact terms as they will match up with those properties on the utterance. In order to start out speech synthesis working we will need to determine the voice that the text is going to be synthesised in. To do this we will listen for when the voiceschanged event fires on the speechSynthesis object (as this needs to load before we can access the available voices). Once we have these loaded we need to insert them into the voices dropdown selector. We also need to listen for when a voice has been selected from the dropdown menu. If you guessed that we're going to need another event listener and function then you have been paying attention. Well done. Every time we alter the voice, or rate or pitch we want to restart the speech with the new properties. Now that we have the speech synthesis working on a basic level let's add the ability for the users to edit the options (rate, pitch & message). The final task is to hook the buttons up. First, eventListener. Then call toggle. Done. Now we have working Speech Synthesis! 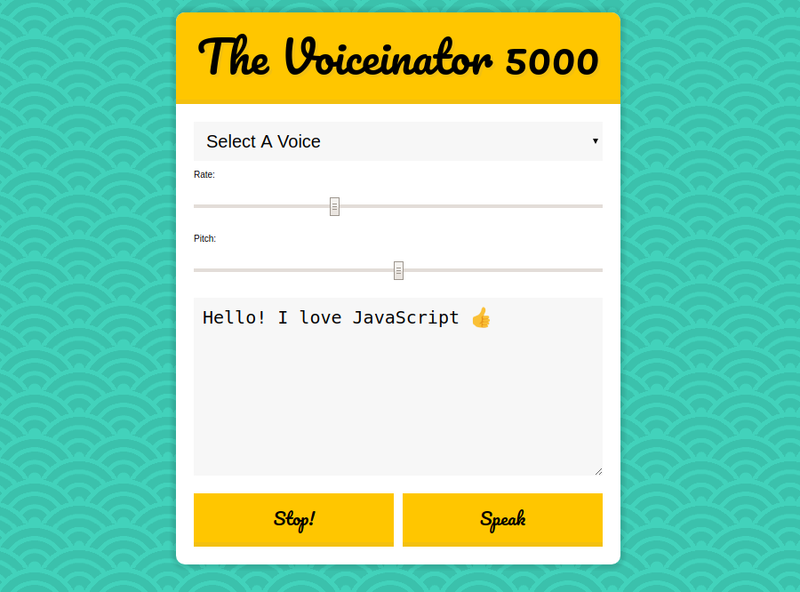 You can play around with the Speech Synthesis project here.